All plants are $8 unless otherwise marked. Golden Bear's Breeches. Golden foliage, purple flowers. Grows to 60cm. Tolerates a wdie range of conditions. Common Yarrow in a variety of colours. Grey green leaves with brillinat yellow flowers to 15cm accross. Very adaptable, grows to 120cm, best in full sun. White flowering Yarrow to 75cm. Full sun, easy to grow. Shasta Daisy, 30-60cm tall, full sun. Kaka beak. Red flowers and glossy green leaves. Extremely rare in the wild. Dark green, evergreen foliage with flower spikes from 50cm to 2 meters, each pendulous inflorescens having upwards of 50 flowers. Prefers shade and good drainage. Very wide dark green leaves, large rich yellow flowers for dark shade. Excellent for the dry garden, these grow to 45cm. Their oragne flowers are a great pollinator attractant. Full sun. A climbing yellow flowered bleeding heart. Prefers semi-shade and moist conditions and grows to 3 meters. Very tough plant, great for the dry garden or perennial border. Purple flower spikes will reach to 1 meter. Full sun. Evergreen with great mat forming foliage that will carpet an area. Flower spikes are covered in white and pink flowers to .5 meters. Graceful stems of white flowers, can handle dry and full sun. Grows from 50cm to 150cm. Variegated sword shaped leaves. Blue purple flowers with a white center, likes moist conditions with semi-shade. Grows 60cm to 90cm. Known as Higo or Japanese iris these come in a range of white, blue, violet and pink shades. Good for both wet and dry. Can reach up to a 1 meter. Graceful growth with light purple flowers resembling scabiosa. Good for the dry garden or meadow. Prefers full sun, and will grow up to 1 meter. Red scabiosa like flowers. Grows 45cm to 60cm. Prefers full sun and can handle dry conditions. Mingimingi. Open habit shrub to 1 meter with white flowers and red berries. Also known as tiger lily, a great bloomer, orange with darker speckels. Flowers are followed by the formation of bulbils on the stem. Flowering spike from 1 to 2 meters. Great for borders and edges. 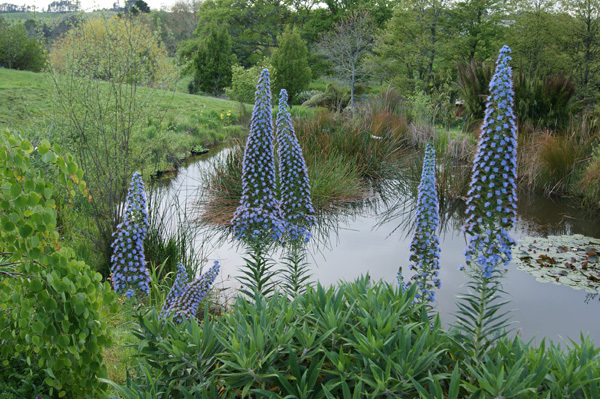 Tufts of clumping blue green foliage topped with blue flower spikes. Full sun to shade, prefers well-drained soil. Grows 30cm to 60cm. Gooseneck Loosestrife. Spikes of white flowers, grows to 90cm. Prefers moist soils. Coastal Mahoe. Small shrub with an upright growth habit to 2 meters. Restricted in the wild to the upper North Island, flowers are small, yellwoish-green, and berries white spotted with purple. Flowers are scented and white with pink centers. grows to 90cm and prefers full sun and a moist site.. Flowers are a pink star with white margin . Grows to 90cm and prefers full sun and a moist site.. Same as above but with lavender/pink flowers. A white flowering phlox. Full sun, well drained soil. Great fuzzy foliage, and interesting yellow flowers tiered on the flower stalk. Grows to 90cm, great for full sun and dry conditions. Obedient plant. Pure white flowers to 60cm tall. Full sun to part shade, and good for butterflies. Fun to play with as the flowers can be twisted on the stalk where they'll hold their position. Kumarahou. Grows well and poor dry soils. Yellwo flowers in spring, grows to 2 meters wide by 50cm-60cm tall. Good for the rock garden, or any well drained soil in full sun. Magenta flowers and glossy green foliage. Grows 45cm to 60cm. Prefers full sun and grows well in poor soils. Up to 90cm tall, various sahdes of blue flowers depending on selection. Prefers full sun and grows well in poor soils. New foliage and stems of El Cielo emerge purply-blue. Flowers are blue with a white throat. Mulberry Jam: flowers and bracts are pinky red, an excellent bloomer. Bethelii: Fuchsia coloured flowers. All to 1.2 meters. Great for atracting bees and butterflies. Grows 15cm to 30cm tall. Prefers full sun and is drought tolerant. A very graceful woodland plant. Columbine like foliage and purple flowers. grows 60cm to 90cm tall. Erect stems to 30cm and blue flowers to 2.5cm. Easy to grow in either full sun or shade. Closely related to allium, this is a very showy specimen. Flowers are lilac and sweetly scented. Very adaptable from dry to moist, but well-drained. Prefers full sun. Inside-out-flower. Closely realted to Epimedium, this is a great groundcover for dry or moist shade. White flowers, compound foliage, makes a nice mat not exceeding 30cm in height.